Cartagena is the city of eternal summer, Bogota of eternal fall – and Medellin is the city of eternal spring. The pleasant climate in Medellin makes the city ideal to visit all year around and a city tour in Medellin is a breeze (pun intended). Get 10 Free Travel Inspired Instagram templates today! Travel back in time to see what a typical Antioquia town looked like at the turn of the century. Set up in 1978, Pueblito Paisa is a replica of an old town – with a church, a stone fountain, local cuisine and an idyllic atmosphere. Pueblito Paisa means ”little town” but it’s a place of contrasts and the perfect first stop during a city tour in Medellin. The small town is located at Nutibara Hill and offers a stunning panoramic view of the big, modern city of Medellin. The city of Medellin is divided into 16 comunas (communes). The areas in Medellin are also categorized from 1 to 6 – 1 being the poorest areas and 6 being the most affluent, like tourist area El Poblado. The comunas up in the mountains, like Comuna 8 and 13, are in the categories 1–3. If I had done my research properly before the tour, I would’ve asked our guide to take us to Comuna 13. This comuna is the most notorious in Medellin and used to be the most dangerous one with drug wars and crime being part of everyday life. Comuna 13 also has the famous “escalators to heaven” and amazing street art. Our guide took us to Comuna 8, also an interesting comuna. A visit in a comuna should be on your Medellin itinerary, you’ll get to experience authentic atmosphere and see what daily life looks like in Medellin outside of the wealthy tourist areas. Not only that, you’ll get the most amazing view of the city from the cable car on your way up to the comuna, and from the comuna itself. 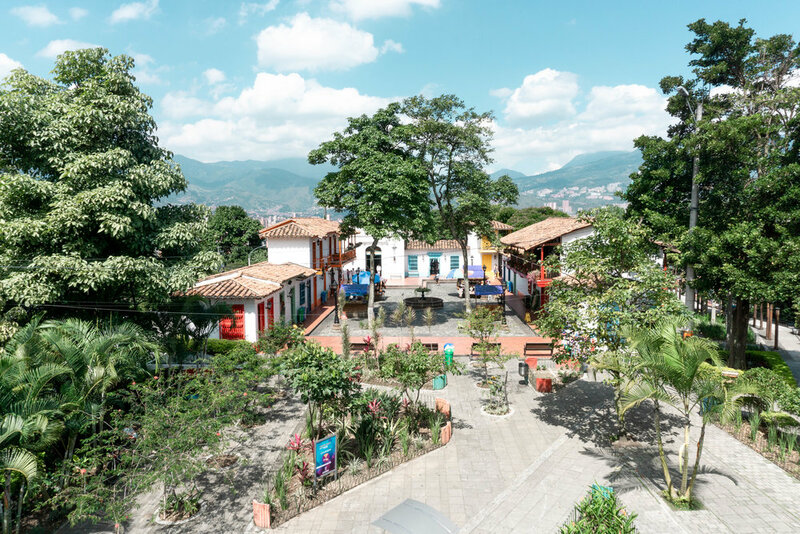 See locals go on about their day by heading to Berrio Park in the heart of Medellin. Throughout history, the square has been a market, held executions, and housed rich families of Medellin. Today you will find the La Candelaria church here, the statue of politician Pedro Justo Berrio, and murals showing the history of Antioquia. Located in the Old quarters, Bottero plaza is an outside park with 23 sculptures with a distinct look on display. The chubby sculptures are the work of Colombian artist Fernando Botero. Born in Medellin, Botero is the most famous living artist from Latin America and his work can be found in metropolises like New York and Paris. It is said rubbing the statues will bring luck, which is why the private parts of some statues have a different shade than the rest. I had my first empanada in Botero Plaza. An empanada is fried dough stuffed with meat and potatoes, topped with spicy sauce (optional). I will always remember my first empanada – it was THAT delicious. Make sure to stop at a local restaurant or hole-in-the-wall, you need empanadas in your life. I’d highly recommend a guide for this part, unless you know everything about Pablo Escobar and Medellin – and I mean not just what you’ve learned from Narcos on Netflix. Our guide Oscar from Viator took us on a city tour, which included significant locations in Pablo Escobar’s life – Escobar’s last hideout and the house he was killed in, the Monaco building bombed by the Cali Cartel in an attempt to kill Escobar’s family, and Escobar’s grave in a local cemetery. There are also day tours fully focused on the life and death of Pablo Escobar. I can highly recommend Viator, their guides are knowledgeable, professional and friendly (this post is not sponsored, I just loved our day with Oscar). 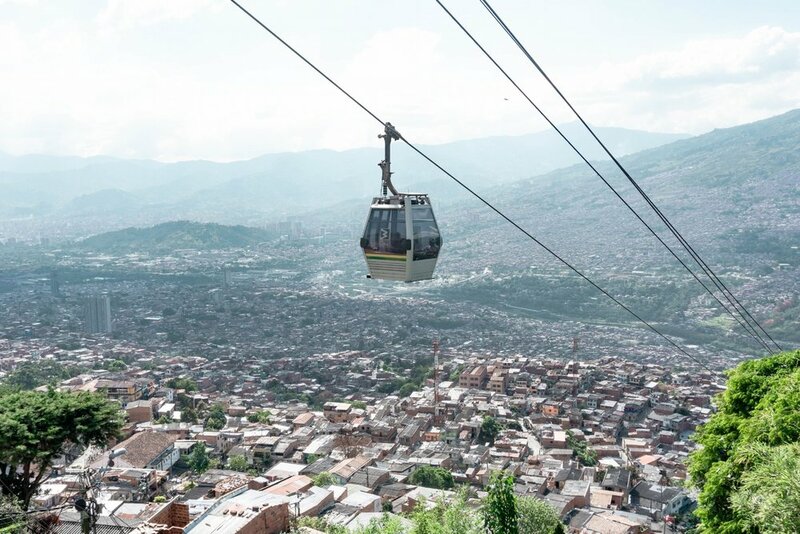 So there you have it, 6 things to do when in Medellin – the beautiful city of eternal spring. Want to be a guest blogger on Roaming Nanny? Find out more here!